Wee Blue Swirls: Let's Celebrate! I hope you all had a great weekend and managed to get some crafting done. 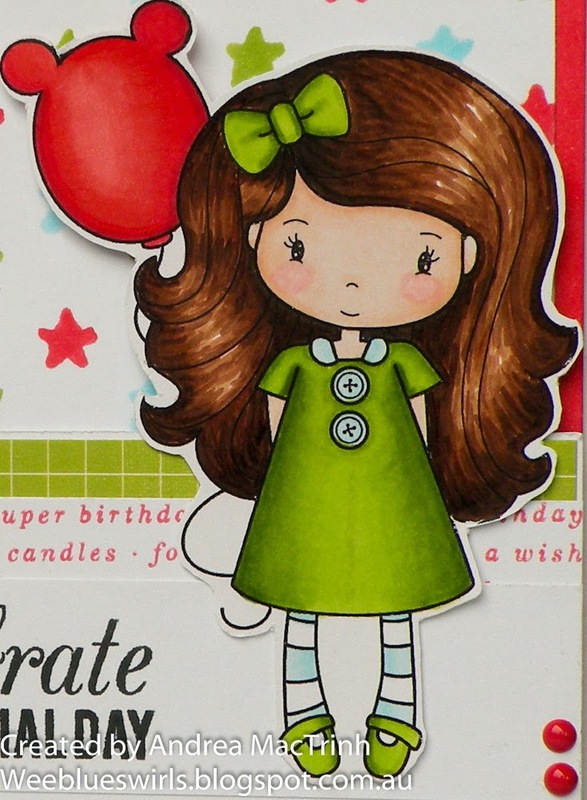 Today is my DT day over at Whimsie Doodles and for my card I chose the very cute Balloon Lizzie. I coloured this cutie with my copics and fuzzy cut her out. As usual I coloured her first without picking my paper and then couldn't find the right papers in my very large stash so I decided to create my own background. How is it that with my masses of paper both 'real' and digital I can never find what I want?! For the background I used MFT starry night stencil and my copics. I realised half way through that I had not used the correct cardstock so my copics bled some - whoops! Oh well, I like to call it the handmade touch!! That's it from me today. Take care and I hope to see you soon. Beautifully coloured image and I love the starry background you created! Thanks so much for sharing with us at Seize the Birthday! Love your little Lizzie, and your use of the stencil is awesome. And yeah, what's up with never finding just the right background out of the stacks and STACKS of patterned paper we have. Guess that's what makes is talented card makers, we have to have just the right thing. Your card is so stinkin' CUTE!!! Thanks for playing along with us this week at Just Us Girls! LOVE the background you created and I think your coloring is utterly fabulous!! I really love this card Andrea! I am glad you didn't find the paper you were looking for. Thanks for joining us at Seize the Birthday and Just Us Girls too. Love your work! What a beautifully colored image, and that star background looks fine to me! Thanks for joining us at Just Us Girls! 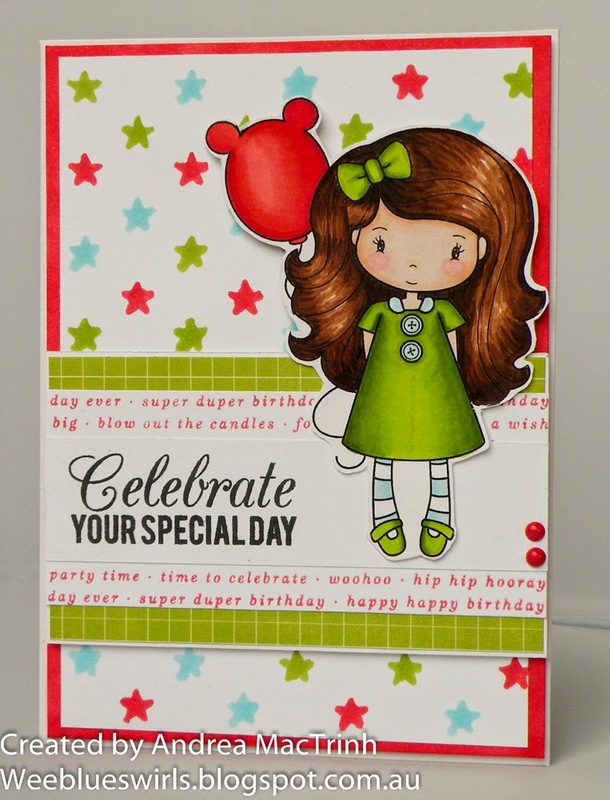 Love your coloring on this very cute image and how you carried the colors over to your stencil! Great card! That's lovely. Sweet image and fab colours.